The prequel opens Fourth of July to essentially ask: How did we get to this point? It's time for another "Purge." "The Purge" arrived in 2013 with a high concept – a reconstituted U.S. where murder is legal one night a year – and low box office expectations. The flick sold plenty of tickets and struck even more nerves. Now, five years and three movies later, "The First Purge" opens Fourth of July to essentially ask: How did we get to this point? It's a good question – one that's relevant on different levels, cinematic and otherwise. 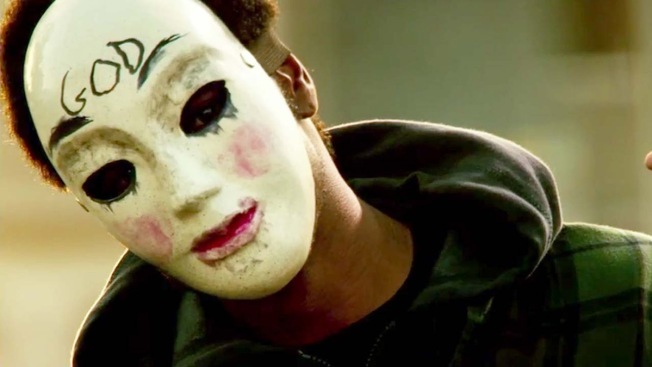 The "Purge" prequel lands a half-century after two game-changing films debuted less than four months apart, barely giving moviegoers time to catch their breath. "Rosemary's Baby" and "Night of the Living" didn't provide an escape as much as a way to process fears during a turbulent period. The movies differed in budget and plot (living-color urban Satanists vs. black-and-white rural zombies). But both transcended traditional B-movie chiller-thrillers to deliver (human and human-sacrificed) food for thought. The films' smart, trapped-by-evil claustrophobia pounds through recent flicks like "Hereditary" and the brilliant "Get Out," both varying cuts above the usual moviehouse scare fare. Meanwhile, "It," from Stephen King, the master of finding the disturbing in the ordinary, placed seventh in the 2017 box office competition, more than 40 years after the film version of "Carrie" turned proms into another kind of fright-night. The "Purge" series exists in its own movie netherworld, lightly tapping the ethos of the thinking person's horror flicks, while unleashing the buckets of blood associated with lesser films. Much of its power derives from the barely-distant future setting. The ostensible purpose of the purge is to get the evil out of the nation's collective system and live relatively crime-free the rest of the year. But through the original, "The Purge: Anarchy" (2014) and "The Purge: Election Year" (2016), it's become increasing clear that the annual mayhem ritual is a tool of the rich, politicians and gun interests to eliminate the poor, make money and consolidate power. There's little subtle about "The Purge" series – including its promotional approach. The creative team teased the latest installment in January by slapping the title on a red cap, with white lettering similar to "Make America Great Again" hats. No one is going to mistake "The Purge" series for Oscar-recognized efforts like "Rosemary's Baby" and "Get Out." But it's difficult to shake the timely, raw dystopia of "The Purge," whose gunfire barrage resounds 50 years after "Rosemary's Baby" and "Night of the Living Dead" got us to mull the root of our fears.